Ask fellow campers about "Willapa Harbor Golf and RV Park" and nearby attractions. I stayed 2 nights from June 3 to 5. First of all when i checked in the clubhouse , manager was friendly (even He's speaking skill wasn't good). We take the rv+golf pack ,so we paid 2 persons green fee for 3 persons. W.C was clean, hot water shower was good too. We also used BBQ grill with no charges. It wasn't much recreation stuffs ,but reasonable price with good facility. Free wi-fi also included . All hook-up were well maintained too. My opinion " cozy, golf, no extra charge in facility." good~! They has several discount promotions so before you go check the web-site "rvgolf101" also they are welcome to pets. We camped at Willapa Harbor Golf and RV Park in a Travel Trailer. Little far from grocery , "Everybody's supermarket" takes 15mins from rvpark. Very peaceful and staff is very friendly. Camp sites are very short distance from the 1st Tee Box. Pets are allowed on the course but should be leashed. Large screen TV's in two different lounges. A very quiet place at night with no traffic noise. Just a short distance from town that offers nice restruants and stores. We camped at Willapa Harbor Golf and RV Park in a Motorhome. Nice park a short drive out of town. They obviously cater to golfers, but are quite friendly to other RVers. Sites are basically in a field adjacent to the course, with power and water hookups. Very peaceful at night, especially when only a handful of the sites are occupied. I looks like quarters would get pretty tight if every space was booked -- we saw 3 only picnic tables to share among the campers. Bathrooms were clean, with private toilet, sink and shower stall in each one. Very fast Wi-Fi as well. We camped at Willapa Harbor Golf and RV Park in a Motorhome. An excellent stop for those who want to explore the southwest Washington coast and especially for golfers who will enjoy the course and love being able to walk to the first tee from their RV. We came for 3 days and stayed a week, enjoying a pleasant spot overlooking the 9 hole course and the practice facilities. The owner is friendly and really made us feel welcome. 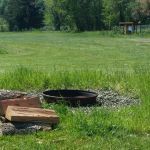 The grassy RV sites are more than adequate. The nightly rate varies because of the several golf packages offered. For us golfers, this park was a fabulous find! We camped at Willapa Harbor Golf and RV Park in a Motorhome. 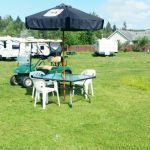 Are you affiliated with Willapa Harbor Golf and RV Park ?